It's a Hole-In-One with an Overnight Stay and Golf at Mohegan Sun! Tee off on the greens of Mohegan Sun Golf Club! Then after you've played the beautiful course, indulge in all of Mohegan Sun's amenities with this special hotel package! Guests will receive 2 rounds of 18 holes of golf, a $25 beverage comp to use at the Club House and overnight accommodations to Mohegan Sun's world-class hotel. This deal is definitely above par! 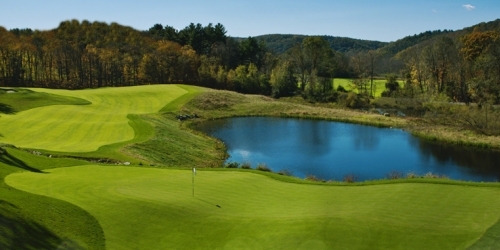 When calling 888.777.7922, please mention you saw this golf package on ConnecticutGolf.com. Mohegan Sun Golf Club reserves the right to change price and offer at anytime. Prices and offer are subject to change without notice. ConnecticutGolf.com is not responsible for errors posted in this golf package.